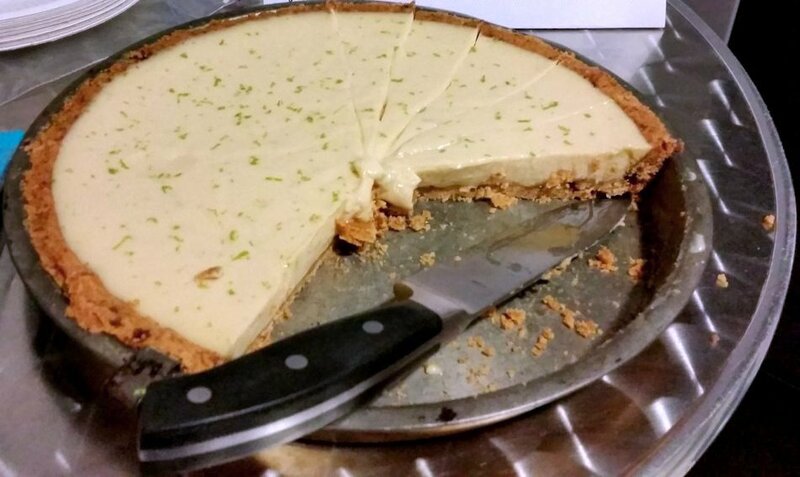 As the name suggests, Key Lime Pie (KLP) is a pie that is made with juice from... Key limes! I.e, limes from the Florida Keys archipelago (and many other tropical areas, by the way). I was introduced to this delicacy when I moved to Florida in 1984, and Peppi Haywood used to make these pies when the fruit on the big Key Lime bush behind the house in Lighthouse Point was ripe. KLP has a very pale yellowish color, partly from egg yolks (if any) and because a ripe Key Lime and its juice are yellow! Compared to Persian limes (citrus latifolia) that are green and have greenish juice, Key limes (citrus aurantiifolia) are small (golf ball size), round, more tart, more acidic, have a thin rind, stronger flavor, and are juicier. Key limes do not originate in the Florida Keys: the European invaders brought them from Southeast Asia to the carribean and the Americas. This is why they are also referred to as Mexican limes and West Indian limes. However, the KLP does originate in Florida. Unless, of course, you're from Cuba, and call it Pastel de Limoncitos Criollos. One of the main ingredients of KLP filling is sweetened condensed milk. It requires no refrigeration (important in tropical climates such as Florida) and the cans have a shelf life of several years. In the USA, it was patented in 1856 by Gail Borden (US patent nr. 15,553). However, preserving milk by condensing goes back at least to the 13th century nomadic Tatar people, and Borden's patent is also predated several decades by Nicolas Appert, the French inventor of airtight food preservation (incl. canning). 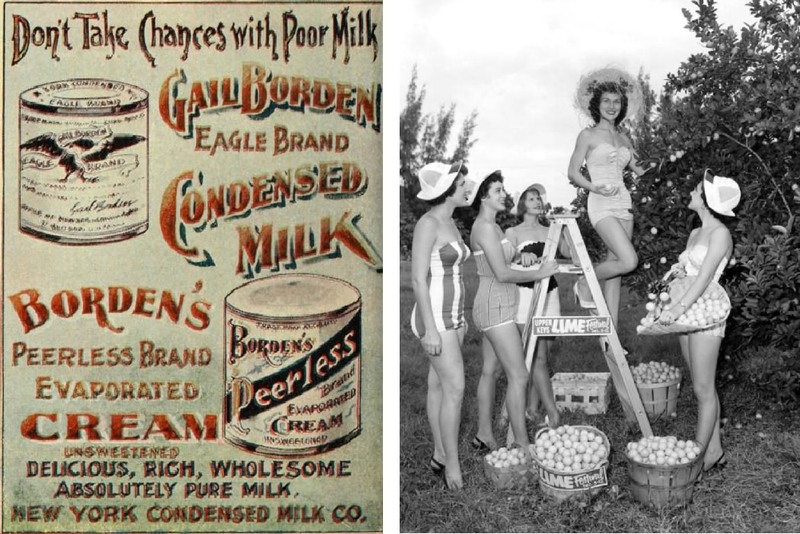 Anyway, Borden's condensed milk certainly was available in the Florida Keys in the 1890s, when the KLP is supposed to have been created. The KLP became the offical "state pie" of Florida in 2006. Some restaurants, bakeries, and supermarkets sell green (!) KLP. This has food coloring in it, and is usually not made with Key Lime juice, but with juice from regular (persian) limes. Anyway, they are not KLPs! By the way, a real KLP is never baked! The acid in the key Lime juice reacts with the other ingredients (sweetened condensed milk, and egg yolks - if any), and "cooks" the protein. However, commercial pies are almost always baked or use pasteurized eggs/egg yolks. This is done out of a largely unfounded fear for being sued for salmonella poisoning when using unbaked ingredients. Some old KLP recipes use no egg yolks (eggs were expensive). Some recipes use many yolks. The more egg yolks the KLP pie filling has, the more the pie will become like a custard, especially when baked. A real KLP is creamy! I do include egg yolk, but not much, and my KLP is quite creamy. Some non-original recipes even mix in softened cream cheese - yuck! The pie crust... well, most people make a so-called Graham Cracker crust. That is, made with ground-up "Graham" crackers. Actually, most people just buy such a ready-made pie crust in the supermarket (at least in the US). Why a Graham Cracker crust? Good question. Some say it's "tradition". If so, it's a bad one. 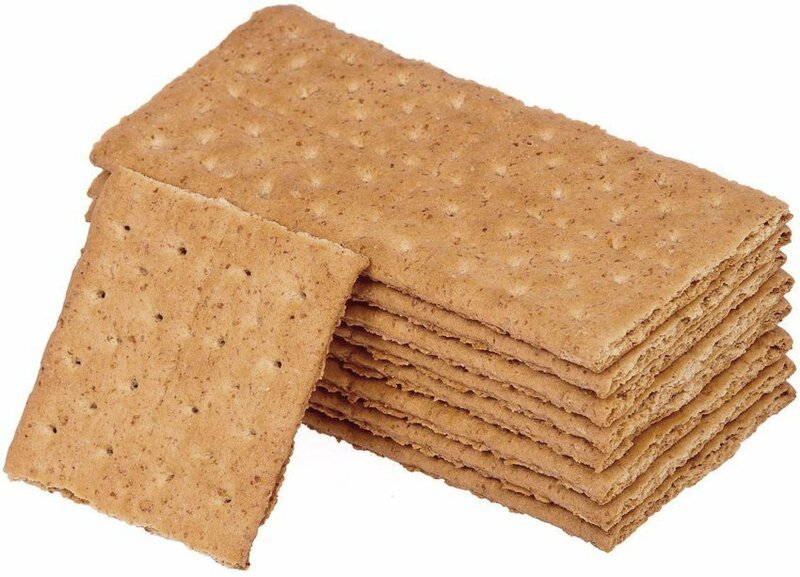 The original commercial Graham Crackers date back to the late 1890s. Unlike post-1930 Graham Crackers, they were not loaded with sugar and preservatives. Quite to the contrary! They were inspired by Sylvester Graham, a ascetic zealot who was opposed to all of life's hedonistic little pleasures. However, he also promoted a high-fiber whole-grain vegetarian diet and spoke out against processed, store-bought food with its many bad additives. OK, we have to give him plenty of positive credit for that... He died prematurely at age 57, some 50 years before the crackers were named after him - Graham did not invent them. And he would probably turn in his grave, if he knew that the awful crackers he inspired would be used in pies! The only reason these whole-wheat crackers are used "traditionally", is that - just like condensed milk - they have a near-infinite shelf life. So most people had (have?) some in their pantry, ready to be used for... who knows what! In some parts of the world where Graham Crackers are not sold, people use salty digestive biscuits as a subsitute. Say no more! Well, if a Graham Cracker crust will do, so will basically any other type of pie crust, including plain Marie biscuits. To hell with bad traditions - just use a tasty and equally simple standard shortcrust pastry dough for the crust! One of the "traditional" KLP toppings is a soft meringue. This is basically a whipped-egg-whites-and-sugar desert all by itself. Note that there are three different kinds of meringue: French, Swiss, and Italian. 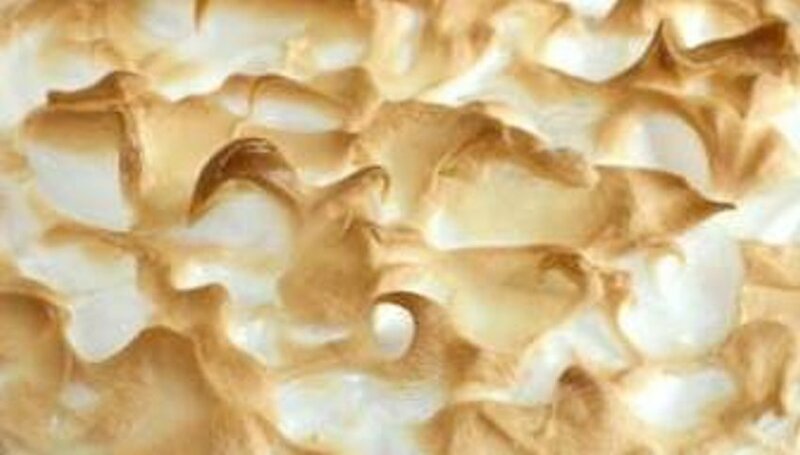 French, or "common" meringue tends to be less dense, and is used on KLPs. It is also the easiest to make of the three: beat egg whites until they soft peaks form (as the protein molecules unfolds), then slowly incorporate sugar. French meringue is normally baked, or folded into a batter and then baked. To make Swiss meringue, you mix egg whites and sugar, then beat the mixture in a double boiler ("bain marie"). It is smoother, silkier and denser than French meringue. Italian meringue is dangerous to make: egg whites are beaten until stiff peaks form. Then, while continuing to whip, boiling sugar syrup (like lava: much hotter than boiling water!!!) is drizzled in. Note that soft meringue (i.e., not baked until very dry) starts to break down and "weep" after a day, and becomes sticky and chewy - especialy when kept in a refrigerator! I prefer KLP (and most pies for that matter) without a topping, but described further below is how to make a French meringue topping. Alternatively, use stiff whipped cream. Refrigeration time: at least (!) 4 hours. Makes 1 pie with a diameter of ca. 22 cm (about 9 inch). Best when made a day ahead (without topping!!! ), for zestier taste! The French translation of my recipe is here. I make the crust with a "pâte sablée" shortcrust pastry dough. "Short", as in "shortbread" and "shortcake", simply means that the dough includes quite a bit of fat (here: butter) that stays relatively solid at room temperature. This fat (and sugar) makes the gluten strands shorter, which makes the baked product a little softer and more crumbly. That's all! And, yes: the common white Crisco-style "axle grease" is also a shortening. I use the same shortcrust dough as in my "lemon (or raspberry) quark cheesecake" recipe. If you want to make it really nice: use only 100 grams of flour, add 30 grams ground almonds (F: "farine d'amande") or coarsely ground candied hazelnuts (F: "pralin"), and 2 tablespoons finely grated, sweetened coconut. 100 grams unsalted butter (F: "beurre doux"), at room temperature, cut into pieces. 40 grams brown sugar or dark brown sugar (5-10% molasses). In France, you can use "sucre complet" or "sucre intégral" as a substitute; remote second choice: "cassonade" ( = sucre roux de canne) or "vergeoise" ( = sucre roux de betterave). Optional: 1/4 teaspoon ground cinnamon. My KLP pie filling is a minor variation on the one in this recipe. It appeared for decades on the label of cans of Carnation (now Nestlé) sweetened condensed milk. Absolutely do not use "evaporated milk"!!! " Sweetened condensed milk and evaporated milk are not interchangeable! 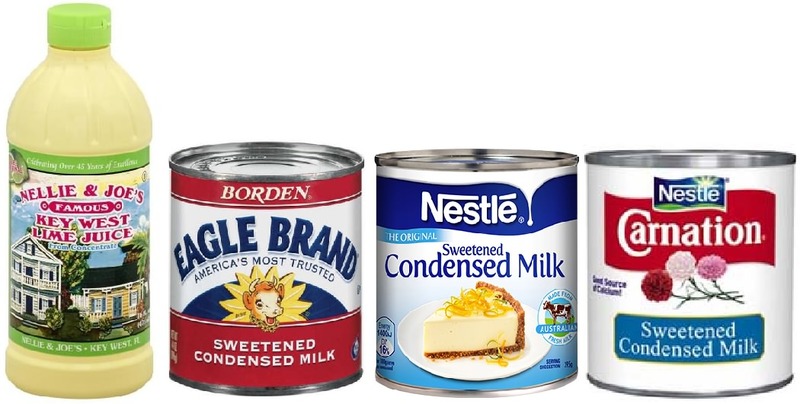 Sweetened condensed milk is 65% sugar (40% by volume). The sugar gives the milk a (very) sweet, caramelized taste, a light beige color and a very thick consistency. In a pinch, you can try 50/50 fresh lemon juice and fresh regular lime juice (just don't you dare call it a "KLP"). Fresh zest of 1 regular ("Persian") lime - zesting is best done with a microblade zester instead of an old fashioned scraper. Optional: keep some of the zest apart, to sprinkle over the pie. Optional: 1 more persian lime, thinly sliced, for decorating served pieces of pie. White from fresh eggs ( = less than 3-4 days old) will result in more stable egg white foam; older eggs will result in more foam volume. Use fresh eggs! Very fine sugar dissolves faster and better than regular, more coarse, table sugar. If you don't have very fine sugar, you can try and put regular sugar in a food processor and run it for a minute or so. This light acid, a byproduct of wine making, is used in beaten egg whites to increase and stabilize the volume. Alternatively, add 1 teaspoon of lemon juice before beating the egg whites. Optional: 1/2 teaspoon real vanilla extract. 1 pie pan, diameter 20-22 cm (8-9 inch), 2 - 2 1/2 cm (1 inch) deep. Zester - a modern microblade zester works much better than an old fashioned "scraper". In a medium size bowl, mix the flour, sugar, salt, butter, and (optional) cinnamon. Pre-heat the oven to 175 °C (350 °F). Cover the bottom of the pie pan evenly with the dough. Do not make the dough layer thicker than about 5-6 mm (1/4 inch); you may not need all of the dough. Bake the crust for 40 minutes at the center of the oven. Note: in a mechanical convection oven (i.e., with fan), use lower temperature setting (e.g., 150 °C = 300 °F). Remove from the oven and let cool - leave the crust in the pan. Make the filing when the pie crust is no longer hot. Zest the regular green/Persian lime. Keep some of the zest to sprinkle on top as garnish when serving. Pour the sweetened condensed milk into a medium size bowl. Condensed milk is very thick. If you want to get it all out of the can, you will have to open it with a can opener. Separate the 3 eggs, and set the egg whites aside for the meringue (or discard, if not adding the meringue topping). Add half of the 3 yolks to the condensed milk. This should be about 1 1/2 tablespoons. Add the Key Lime juice. Mix at low speed until homogenous mass is obtained. Do not over-mix ( = mix-in too much air). Once blended, small bubbles will form, as the acid in the juice will "cook" the egg/milk mixture. Blend in the fresh lime zest. Refrigerate for at least 4 hours or until the filling has set. Make the meringue mix after the filling has fully set in the pie crust, and not more than a couple of hours before you want to serve the pie. The egg whites must be at room temperature when you beat them: cold egg whites do not whip well. However, cold eggs are easier to separate! So: take the eggs out of the refrigerator and seperate them at least 30 minutes before making the meringue. Even very small amounts of fat and oil will increase the time it takes to whip the egg whites to the point where the foam can hold peaks, or - worse - prevent the egg white foam from increasing in volume and stiffening! Do not use a plastic bowl - plastic is almost impossible to clean fat-free! Use a stainless-steel, copper, or glass bowl. But: do not use a copper bowl if you add acid (such as Cream of Tartar) to the egg whites: the chemical reaction with the copper will discolor the egg foam! The bowl and utensils (such as the beaters) must be absolutely clean and grease-free! The skin of all normal, healthy human beings always has some oil on it. Once you have completely washed & cleaned the bowl and the beaters - do not touch any area that may come in touch with the egg whites! Egg yolk will also ruin the egg white foam! If you crack and separate one of the eggs, and a bit of egg yolk falls into the whites: remove the bit of yolk (only) with a large piece of egg shell. Of course, you can avoid this problem altogether, by always cracking and separating each egg away from the bowl in which you are collecting the egg whites. This way, you only lose one egg, instead of ruining all egg whites that you already collected. If you use the optional lemon juice, add it now. With the hand mixer set to medium-low speed, beat until the egg whites are foamy. This should take about 1 minute. The light yellowish color starts to lighten, the mass is still liquidy, and large air bubbles form on top. Continue beating at medium-low speed until the foam starts to increase in volume, begins to turn white, and the air bubbles become smaller. Increase speed to medium-high until the whites form soft peaks that curl over when you stop the mixer and lift out the mixer beaters. The foam should be stiff, glossy, and about 4 times the volume of the unbeaten egg whites. No liquid egg white should remain in the bottom of the bowl. Continue beating at medium-high speed and gradually add the sugar, 1 table spoon at a time. Do not add the sugar all at once! Add the next tablespoon of sugar when the sugar is completely dissolved: rub a bit of the foam between your fingers - you should not feel the gritty sugar grains. After all the sugar has been added, increase the mixer speed to high. Continue beating until the foam is white, fluffy, firm and glossy. Once the foam is firm, you can add the optional vanilla extract. Definitley STOP beating as soon as the foams shows first signs of becoming lumpy or becoming less glossy! If you pull out the beater, the peaks should hold and not droop. If not, beat for a few seconds more. Careful: the foam can go from "stiff" to "overbeaten" in less than 30 seconds! Spread the meringue onto the pie with a spatula (or pipe it onto the pie), making sure it touches the crust all around. Method 1: Use a kitchen blowtorch to lightly brown the meringue all over. Method 2: Brown the meringue under the broiler in the oven. Once the browning starts, it goes very fast! Do not walk away!! Method 3: Bake the pie at 210 °C (425 °F) for about 5 minutes, until tips of the meringue begin to brown. Decorate with thin slices of a regular Persian lime. ©1984-2018 F. Dörenberg, unless stated otherwise. All rights reserved worldwide. No part of this publication may be used without permission from the author.